It is very possible that I am the only person who will read this book who has never read a single “Pern” book in the Anne McCaffreey canon. I am, of course, familiar with the books…in large part due to the awesome covers by Michael Whelan, whose art I relished at a time I had hopes of becoming a professional artist. But I was not really in to fantasies filled with dragons at the time. But now…well, now… after reading this collection of remembrance essays on Anne McCaffrey, it seems that my impression of the Pern books may be flawed, and I just might really enjoy them after all. Add MORE books to my reading list — check. But to this book in particular… this seems to fit in the biography week theme because we not only learn a great deal about Anne McCaffrey as a person and a writer, we learn a little about a number of the people who offer up their thoughts as well. Sometimes a little too much. We learn about Anne’s interest in music and singing and her early desire to be an opera singer (and how she fittingly wove this interest in to the book The Ship Who Sang). We learn a little about Anne’s being one of the first, respected women writing in a genre that was then dominated by men. We learn about Anne’s generous, giving spirit and her ability to make long-lasting friendships. She definitely comes across, not just as a talented, gifted writer, but an incredibly wonderful human being. The book does exactly what it sets out to do, which is to pay tribute to an author and one of her more popular creations (Pern). I was often moved by the stories, and I’m definitely intrigued to get to know Pern now. What the book also does, though, is give us just a fraction of insight in to a number of other people, whom Anne knew. 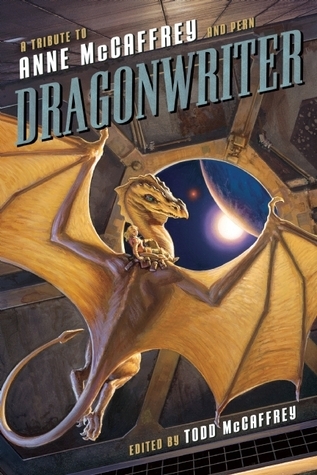 There’s a the writer who learned to write by writing fan stories set in Pern. There’s the artist, famous for his covers of many of McCaffrey’s books. There are television writers. Book writers. Famous fans. And family. Sometimes the stories are a little more about the author of the essay, rather than about Anne (“I met Anne once; she told me <blank> and so I did this and this and this and got all this ackowledgement…all thanks to Anne”). There’s a saying — you probably know it — “You can measure a person not by how much they love, but how much they are loved by others.” Anne clearly measures greatness. Looking for a good book? This tribute book is clearly a must for fans of Anne McCaffrey and her Pern stories, but will also be of interest to anyone who enjoys biographical essays.